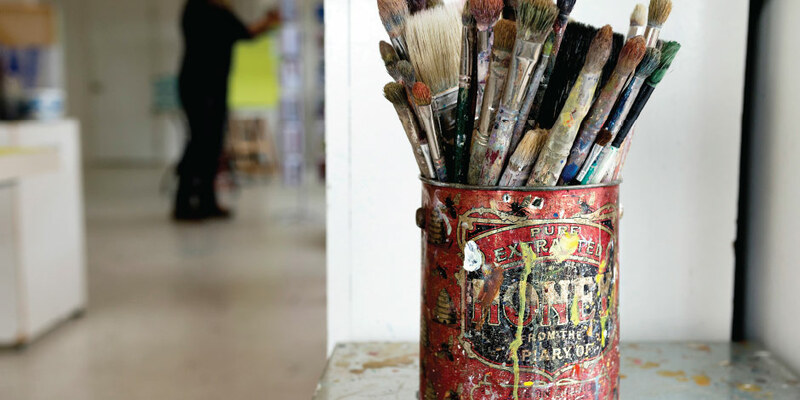 Artists in the Comox Valley create and cultivate a vibrant studio/gallery. the realm of the absurd, the band Bob’s Yer Uncle, artists of many varieties, and I shared a four story building in Gastown, along with a curry restaurant and a broken elevator. It was a fertile Petri dish of creativity; art making and performance thrived there, right in the heart of the city. These days, finding a centrally located studio space, with plenty of natural light that isn’t sketchy and falling apart, can be a challenging process for artists of any discipline. For Helen Utsal and Lucy Schappy, their quest for the ideal space to both create and show works of art, all started with a road trip. Art Alchemy Studio Gallery is located on the second floor of a somewhat contemporary commercial building. When you stroll up the stairs and start to see paintings on almost every available wall, and large windows from one end of the 2200 sq ft space to the other, it’s hard to picture it being anything but a thriving studio/gallery shared by eight brilliant, impassioned artists. Helen and Lucy say it hasn’t always been a walk in the park. They’ve done some work to the place, and dealt with some turn over—all part of the ups and downs of running the ideal space. Having several artists under one roof necessitates creative modifications, such as removable walls to create separate workspaces. Art Alchemy hosts another innovation – The Square Foot Show. Over 40 artists show and sell their original work in a unique 12 inch square format. All works are $200. Now in its fifth year, this event is a major success for the studio/gallery. The artists at Art Alchemy have benefited from their collective willingness to think outside the box, and from the ability to work together to maintain a stable, creative environment in which to make art. “Recently, I’ve felt extra grateful to be sharing work space with artists who have common goals. Part of the next chapter for many of us is participating in big art fairs. Going through the practical experiences, together, of negotiating shipping, pricing, and marketing has helped me stay focused. On the creative side, I know we all feel so lucky to be there. The vibe is very positive and free,” says Helen Utsal. When you’re in that state of mind where inspiration could burst forth at any moment, visit Art Alchemy on any Saturday between noon and 4pm. You just might see a display of adept, thoughtful, brush strokes as a work of art takes shape.